Enable Onion Skin for Other Elements : When both the Onion Skin and Light Table options are enabled, the drawings appearing in the Light Table also display their previous and next onion skinned drawings. This option is for the Drawing view only. Default Multiwheel Colour Picker: Displays the Multiwheel Colour Picker window instead of the regular Colour Picker. Auto Save Pencil Styles: When this option is enabled, new pens and pen styles are automatically saved. Sticky Eye Dropper: Keeps the Colour Picker’s Dropper tool active until it is released by clicking on the Dropper icon again. Desk Location: Defines the location of the Desk panel in the Drawing view. Default Pencil Line Tip: Sets the default pencil line tip to either Round, Flat, or Bevel. Morphing Quality: Sets the default quality value for the morphing sequences. If you change this value, it will not affect the morphing sequence which was created previously. After a morphing sequence has been created using this default quality value, its quality can be changed manually by using the Morphing Tool Properties. Create New Colour Pots Using Default Colour: Set the default colour for creating a new colour swatch. Enable the option so that this default colour is used each time you add a new colour in your palettes. This option is useful for when you create new colour pots so that a more recognizable colour is created and not just a duplicate of the currently selected colour. Choosing a colour that is the opposite of your intended colour palette is recommended, such as grey if your palette will be filled with bright, primary colours. Pixel Density: Determines the amount of pixels to store for each of a textured brush stroke's pixels that display when the scene is not zoomed in or the drawing is not scaled. For example, at 100%, zooming in or scaling up textured brush strokes will make them lose texture quality. If set to 200%, textured brush strokes can be zoomed in or scaled up until they're twice their original size without losing picture quality. NOTEThis setting is applied to your scene's drawing resolution settings when creating a new scene, which is then applied to every new vector drawing created in your scene. Therefore, to apply changes to these settings to an existing scene, they must also be changed in the Drawing Resolution tab of the Scene Settings dialog. To apply changes to these settings to existing drawings, they must be changed using the Change Vector Drawing Brush Resolution dialog available from the Drawing top menu. Canvas Width: The default width of the canvas when creating drawings in a bitmap drawing layer. The percentage is relative to the width of the scene. Its default value, 200%, makes the width of the canvas twice the width of the stage. 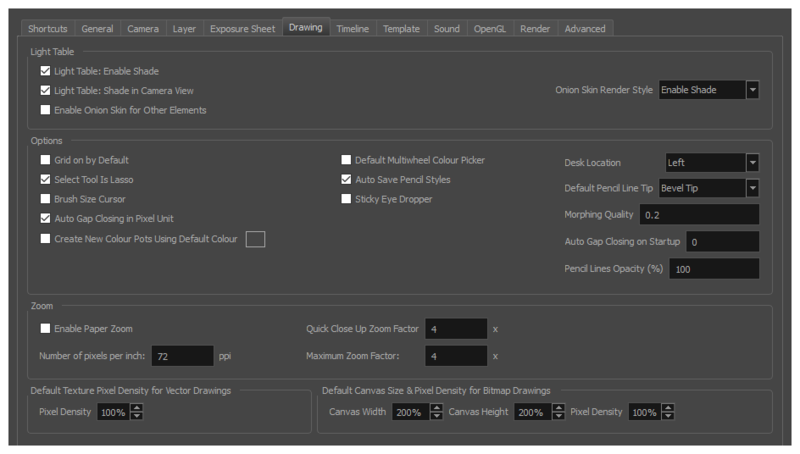 Canvas Height: The default height of the canvas when creating drawings in a bitmap drawing layer. The percentage is relative to the height of the stage. Its default value, 200%, makes the height of the canvas twice the height of the stage. NOTEThese settings are applied to your scene's drawing resolution settings when creating a new scene, which are then applied to every new bitmap drawing created in your scene. Therefore, to apply changes to these settings to an existing scene, they must also be changed in the Drawing Resolution tab of the Scene Settings dialog. To apply changes to these settings to existing drawings, they must be changed using the Change Bitmap Drawing Resolution dialog available from the Drawing top menu.